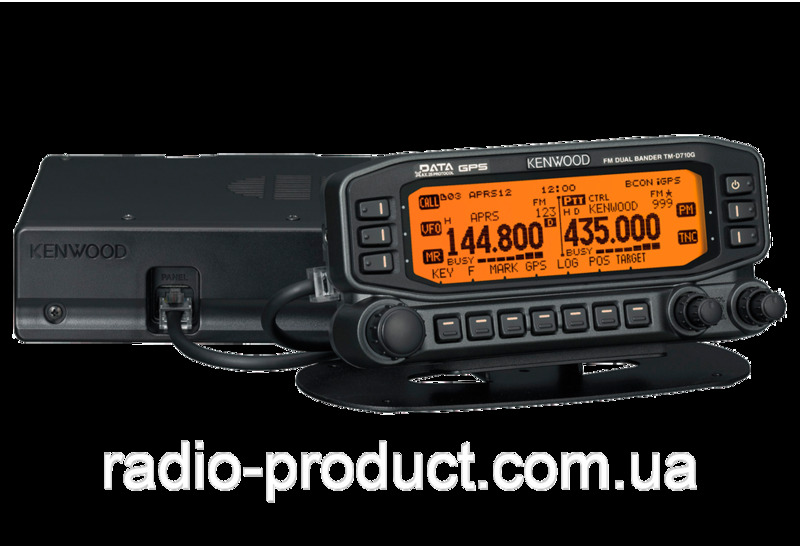 KENWOOD TM-D710G - радиолюбительский двух-канальный, двух-диапазонный 2 м / 70 см FM трансивер-коммуникатор со встроенным TNC-контроллером для работы в пакетных, APRS и Эхолинк сетях. 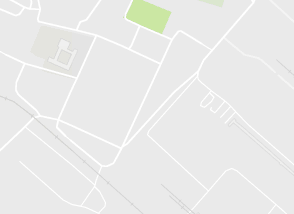 GPS на борту. Конструктивно трансивер состоит из двух частей - из базового блока и выносной контрольной панели. Масса: базовый блок - 1.2 кг; передняя панель - 0.3 кг. Габариты: базовый блок - 140 x 43 x 142 мм; передняя панель - 155 x 70 x 38 мм. The GPS unit required for mobile station APRS operation is included in the control panel. 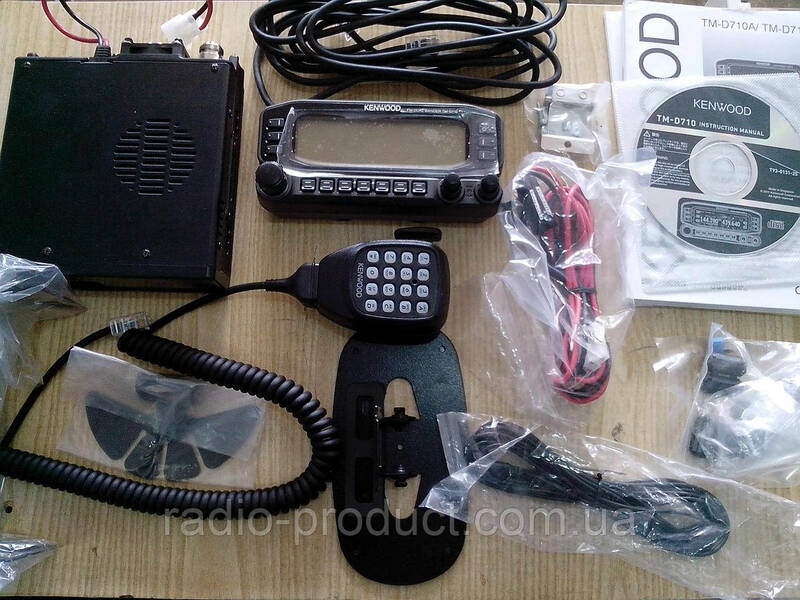 Genuine APRS operation is possible with the TM-D710GA alone. GPS Logger, Mark Waypoint, Target Point, and automatic time correction functions are also included, widening horizons for operation using GPS. A maximum of 5,000 points of positional information can be stored in the internal memory. Storage timing can be set according to time interval, movement distance or beacon transmission points (e.g. roughly 14 hours’ worth of records is possible when set for a 10-second time interval). GPS log information can also be converted to the Google Earth™ map service-compliant kml file format using the MCP-6A memory control program. Positional information on your current location (latitude, longitude and altitude, time, name, icon) can be recorded with one touch. Name and icon information can also be edited in the Mark Waypoint list. The distance and direction to your target locations (maximum of 5 presets possible) are displayed in real time. Directional display can be switched between North Up and the easily understood Heading Up display with one touch. The Grid Square Locator for your own station can be displayed. On-board clocks required for all operations are adjusted automatically using GPS. The device comes equipped with an AX.25 standard TNC (Terminal Node Controller), enabling genuine, stand-alone APRS operation. Connection to a PC also enables 1200/9600 bps packet communication and IGate terminal operation. A program compatible with the APRS system has been developed with the cooperation of Bob Bruninga (WB4APR), the developer of APRS. By making use of this program and the GPS unit*, various APRS operations are possible even without a PC. Messages can also be exchanged to share positional, direction/distance and weather information. *An external GPS unit can also be used. A maximum of 100 stations such as mobile, base, weather and object stations can be maintained, and receive stations can be limited by type using the filter function. Sorting according to callsign, receive time, and distance from own station (stations within 1mile are displayed in 0.01mile units) is also possible. Latitude, longitude, altitude and speed/direction can be shared, and the distance from your station can be displayed using received station information. Messages can be sent and received between APRS-operating stations. In addition to keyboard input using the included microphone, easy mobile operation has been pursued with the inclusion of automatic reply and set-message functions. A special call function also lets you know the instant you receive a message from a dedicated station. Weather information can be received to display wind direction/ speed, temperature, rainfall, humidity and atmospheric pressure. Easy operation of weather stations can also be enjoyed after connection (certain devices only) to Peet Bros. or Davis weather observation devices. The TM-D710GA can operate as a stand-alone digipeater station. Temporary relay stations can be configured in a variety of outdoor situations, enabling support for data transmission from locations such as basins surrounded by mountains. 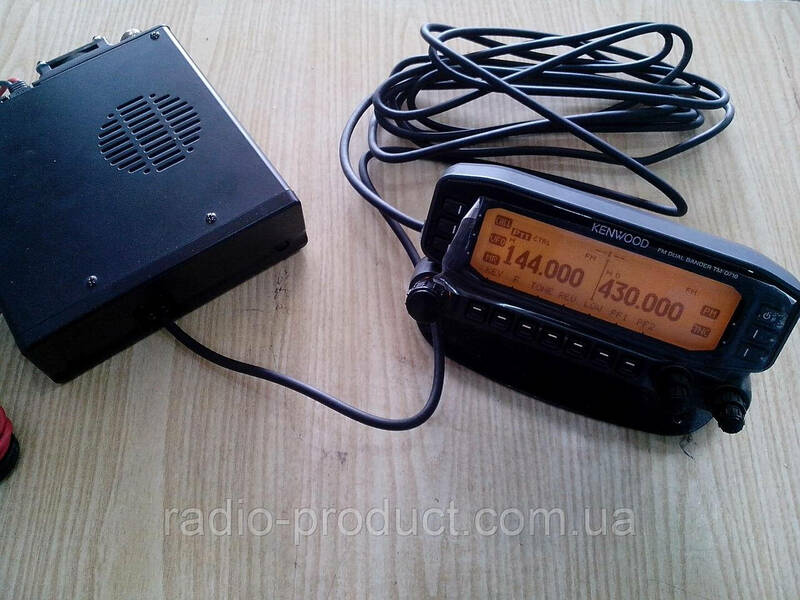 TM-D710GA voice channels can be set with one touch using information such as frequency, tone and shift buried in beacons from APRS stations, enabling speedy QSY. SmartBeaconing is a function that efficiently sends a beacon concerning the positional information of your station based on speed and direction data. The transmission interval can be changed depending on your speed, and beacons are sent when direction changes are detected, so a close approximation of your actual route can be recorded with a minimum of beacon transmissions. 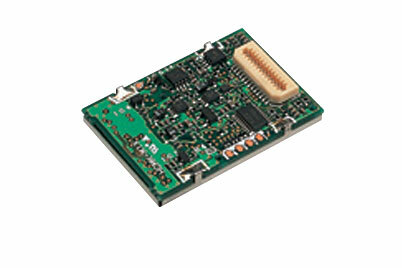 Prevents errors during APRS operation. 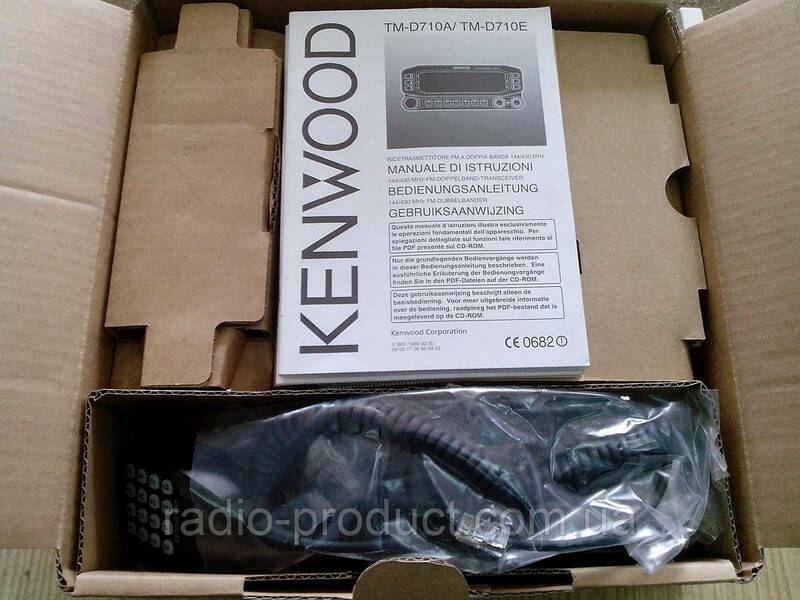 You can use the TM-D710A for remote control of KENWOOD HF transceivers, enabling the enjoyment of HF access even while making a quick trip to the local store. The HF band frequency is displayed, making operation easy. 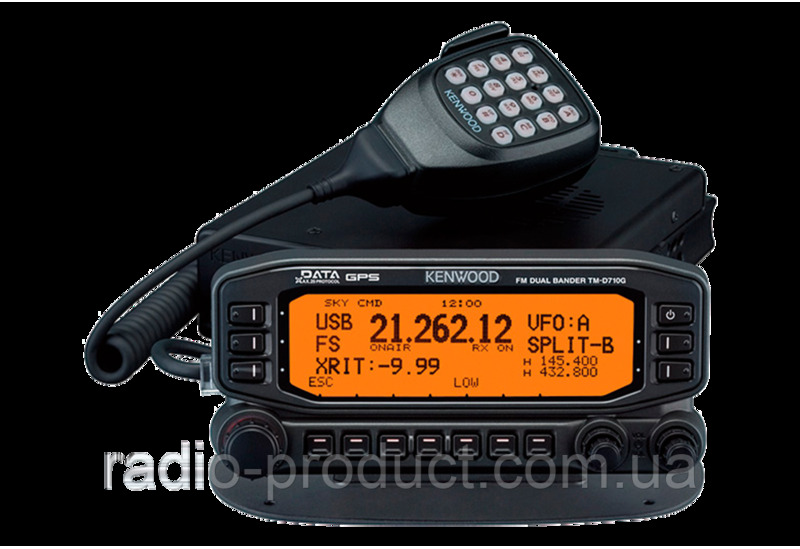 KENWOOD SKY COMMAND SYSTEM II uses a pair of TH-D72A/TM-D710GA transceivers. *The TS-2000 series doesn’t require a transporter. You can easily set up an EchoLink node terminal by connecting the TM-D710GA to a PC with EchoLink software installed on it*1. Simultaneous operation as an IGate terminal and/or digipeater is also possible while functioning as an EchoLink node terminal*2. *2:When connecting the internal TNC to a PC for packet mode, a serial transmission cable (PG-5G) is required in addition to the PG-5H used for EchoLink Sysop mode. A maximum of 10 EchoLink-dedicated DTMF memories can store call-signs, node numbers and control commands. EchoLink memory management is also possible with the MCP-6A. The large separate panel has a liquidcrystal display for each key, enabling prompt access to a variety of functions. Two different stands are included: one each for in-vehicle (panel-angle) and table-top (base-stand) installation. The LCD backlight color can be selected from 2 colors (amber/green). In addition to simultaneous receive on both VHF and UHF bands, the device can receive two frequencies on the very same band. By using the MCP-6A memory control program*1, data creation, editing and management for memory channels, APRS, all EchoLink function settings, and custom start-up screens are possible on a PC*2. ARRL TravelPlus information can also be import to the TM-D710GA. There is a PC connection port on the back of the main body and on the rear of the panel, so you can choose the one that is the fit for your operation style. 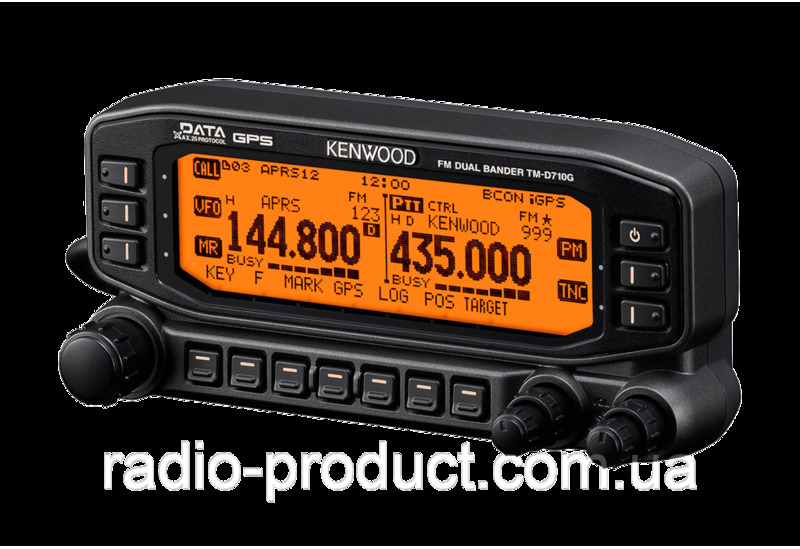 *1： The MCP-6A program will be available as a free download on the KENWOOD website from the middle of November 2013. *2: Connection to a PC requires the optional PG-5G or PG-5H. The device can emit a warning tone when warnings are announced on the NOAA Weather Band. Registered weather channels can also be scanned. By installing this option, key operations can be confirmed via voice announcements (APRS menus can be read out). Voice messages and 30 seconds of continuous recording are also possible. *Google Earth is a registered trademark of Google Inc.
*APRS is a registered U.S.A. trademark of Bob Bruninga. *EchoLink is a registered U.S.A. trademark of Synergenics, LLC. *SmartBeaconing is supplied by Ham HUD Nichetroni. 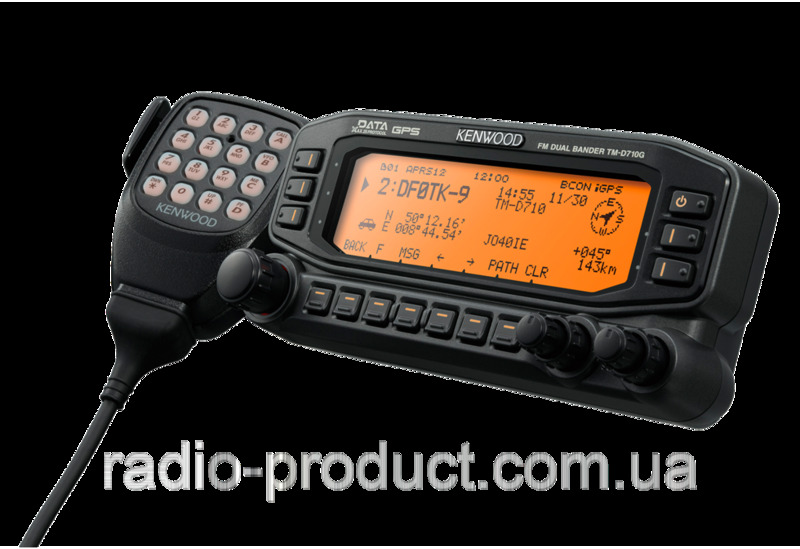 *KENWOOD SKY COMMAND SYSTEM is a registered trademark of JVCKENWOOD Corporation in the U.S.